Poojya Gurudev Swami Chinmayanandaji’s 25th Aradhana day was observed from 01st August 2018 with all its serenity in the Vidyalaya. Bhajans and mass chanting of 15th Chapter of Bhagwat Gita were conducted. This year being the 25th year of Gurudev’s Maha Samadhi, the Vidyalaya is undertaking 25 Seva projects. In connection with 25th Aaradhana Day (03/08/18) of our Gurudev Swami Chinmayandaji, Seva activities started on 2nd August 2018. On the auspicious occasion Shri. Theruvoram Murugan was the chief guest. 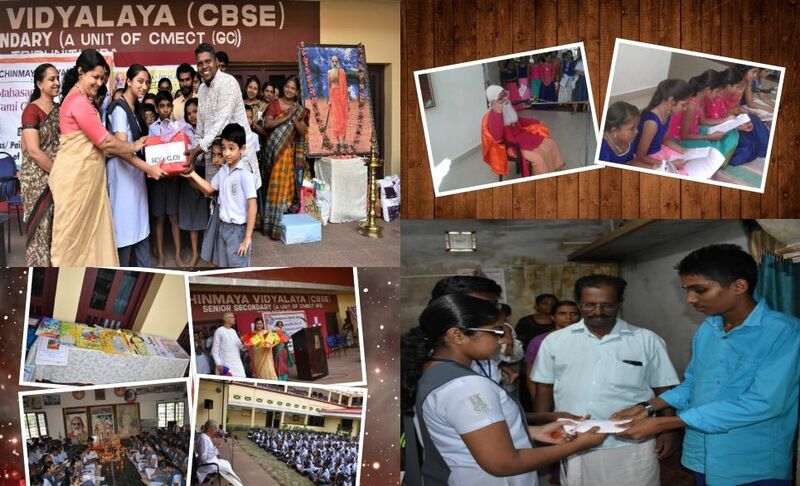 Shri Murugan aroused the students of the need for sharing and caring in human life, the quality which makes an individual a real human being. He also inspired students to respect one’s parents as they are working hard for their upbringing. Students from L.K.G to 12th donated many necessary items including clothes, pulses, grains, and sanitary items for the needy. Students of Std XII contributed an amount to Master Arun Sanu, a chronic kidney patient. Mahasamadhi Day was observed on 03rd August, 2018 with great reverence. Chinmaya Ashtakam was chanted along with the usual prayers. Sri .K R Nambiar, Former President, Chinmaya Mission, Ernakulam was the Chief Guest. Through his simple and lucid words, he motivated the students and teachers, to spend quality time to learn scriptures and make life a better and pleasant experience. He also shared his fond memories with Gurudev and expressed his immense pleasure to step in the Vidyalaya on this great day. An exhibition of the News Letters, based on the life, works and contributions of Gurudev, prepared by students of various classes were inaugurated by the Chief Guest. Students of various classes spoke on the mission and vision of Swami Chinmayananda. A seminar on the topic ‘ The Incomparable Contributions of Swami Chinmayananda on Indian Culture and Spirituality’ was conducted. Selected students from classes V- XII participated in it. Students of the KG, Primary and Middle sections offered their Pranams at the lotus feet of Gurudev by presenting skits and bhajans. A student of class VII declaimed Swamiji’s famous speech ‘ Service Above Self’. The Principal Mrs.Priya C. Pillai addressed the students. All the students of the Vidyalaya offered their humble Pranams to Gurudev and received Prasadam. Bulletin boards were adorned by beautiful charts highlighting his quotes.